Refer to the exhibit. 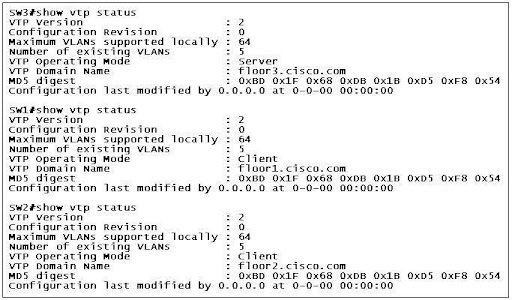 Based on the output shown, to which IP network should the workstations in the Support department belong? Refer to the exhibit. A network administrator is doing proactive network maintenance. The administrator pings 192.168.1.100 and compares the results to the baseline data. Based on the comparison of the two pings, what is one possibility? • There is an ACL applied, making the destination host unreachable. • There is a malfunctioning NIC on the destination host. • The sending host is unable to access the network. • There are congestion problems on the network. • The line protocol of the local router is now up. • The username ’Goleta’ is configured locally. 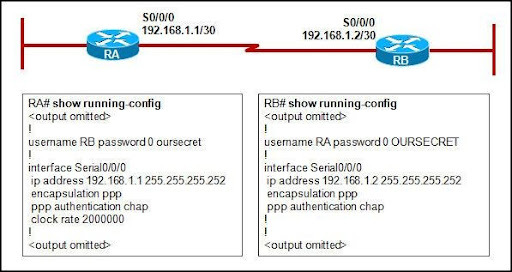 • The command ppp authentication pap is configured on both routers. • The local router requested to terminate the session. 4. What is important to consider while configuring the subinterfaces of a router when implementing inter-VLAN routing? • The subinterface numbers must match the VLAN ID number. • The physical interface must have an IP address configured. • The IP address of each subinterface must be the default gateway address for each VLAN subnet. • The no shutdown command must be given on each subinterface. Refer to the exhibit. A lab technician connects two routers together via a serial cable using the default interface configuration values. The interfaces are up; however, the technician is unable to ping between the two devices. What is the most likely problem? • The lab technician used the wrong cable to connect the serial ports. • There is an IP mismatch between the serial ports. • There is an encapsulation mismatch between the serial ports. • No clock rate has been set on the DCE interface. Refer to the exhibit. Based on the output shown, why is VTP information unable to propagate the network? • One of the two client mode switches must be reconfigured to Transparent mode. • Each switch must be synchronized to the network time server. • The VTP domain names are different. • VTP passwords must be set. • The configuration revision numbers are all the same. 7. The enterprise mail server software recently went through a minor update. A network administrator notices an excessive amount of traffic between a database server and the newly updated mail server, compared to the baseline data. What is the first action the administrator should do to investigate the problem? • Wait to see if the recent update will stabilize after a while. • Redo the baseline data to include the minor upgrade. • Check the log to see what software components are producing the excess traffic. • Check for viruses and spyware on the database server. Refer to the exhibit. Users are reporting that they cannot access the Internet. 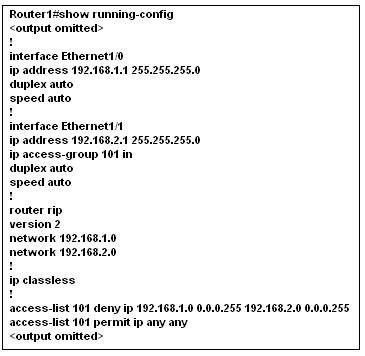 Routers R1 and R2 are configured with RIP version 2 as shown. If R2 receives a packet with a destination address on the Internet, how is the packet routed? • The packet is routed to the ISP router and then to network 10.1.1.0/24. • The packet is routed to the ISP router and then to the Internet. • The packet is routed to R1 and then forwarded out Fa0/0 on R1. 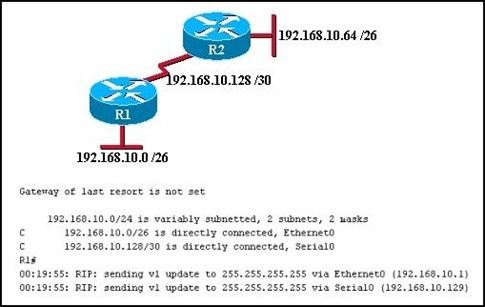 • The packet will not be routed because R2 does not have a valid default route. Refer to the exhibit. Both routers are configured using RIPv1. Both routers are sending updates about the directly connected routes. R1 can successfully ping the serial interface of R2. The routing table on R1 does not contain any dynamically learned routes from R2, and the routing table on R2 shows no dynamically learned routes from R1. What is the problem? • Subnetting is not supported by RIPv1. • One of the routers needs a clock rate on the serial interface. • The serial link between the two routers is unstable. • VLSM is not supported by RIPv1. Refer to the exhibit. Host 192.168.1.14 is unable to download email from 192.168.2.200. After reviewing the output of the show running-config command, what problem is discovered? • Access to the SMTP server is denied. • The destination host address in an ACL statement is incorrect. • The ACL is applied to the interface in the wrong direction. • The implicit deny any any is blocking all access to email. 11. An employee called the help desk to report a laptop that could not access a web-based application on the Internet. The help desk technician asked the employee to open a Windows command prompt and type the ipconfig /all command. Which problem-solving technique did the technician choose? Refer to the exhibit. Based on the network diagram and the output shown, which statement is true? • The command was entered on router R1. • The command was entered on router R2. • The command was entered on router R3. • The command could have been entered on either R1 or R2. Refer to the exhibit. An ACL is configured to prevent access by network 192.168.1.0 to network 192.168.2.0, but it is not working properly. What problem is discovered after observing the output of the show running-config command? • The protocol type specified in the ACL should be TCP, not IP. • The source and destination addresses are reversed in the statement. • The ACL is applied to the wrong interface, but the right direction. • The ACL is applied to the wrong interface and the wrong direction. • The permit ip any any statement allows network 192.168.1.0 access. 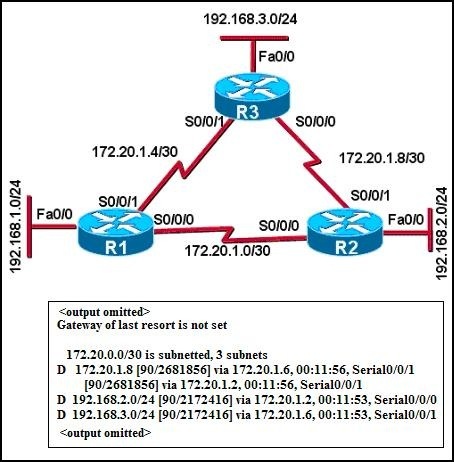 Although all networks are reachable, the network administrator notices abnormal routing behavior after configuring OSPF on each router. According to the partial output from the debug ip ospf events command, which statement is true about the contents of the routing table in RA? • It will show network 172.16.3.0 learned from RB. • It will show network 172.16.3.0 learned from RC. • It will show two equal routes to network 192.168.1.4/30. • It will show two equal routes to network 192.168.1.8/30. Refer to the exhibit. The network administrator is troubleshooting the connectivity issue between RA and RB. According to the partial configuration, what is the cause of the problem? Refer to the exhibit. ABC Company is using the 172.16.0.0/18 network. It is standard company practice to use the first 50 addresses for switches and servers and assign the last usable address to the router. The remaining addresses are assigned to the hosts. After assigning the addresses, the network technician tests connectivity from the host above and is not able to ping the router. What could be the problem? • The router was assigned the broadcast address. 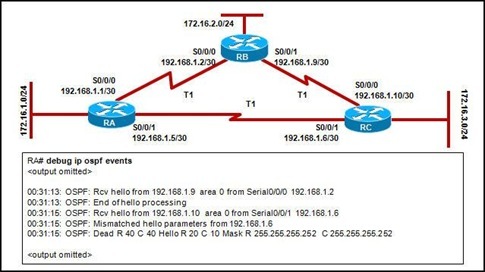 • The host is not in the same subnet as the switch and router. • The router interface is in the wrong subnet. • The host was assigned a network address. Refer to the exhibit. A network administrator is troubleshooting a problem. No users are able to access the 10.10.2.0/24 network, but are able to access all other networks. Assuming R3 is configured correctly and based on the output shown, what is most likely the problem? • There is congestion on the 10.10.2.0 network. 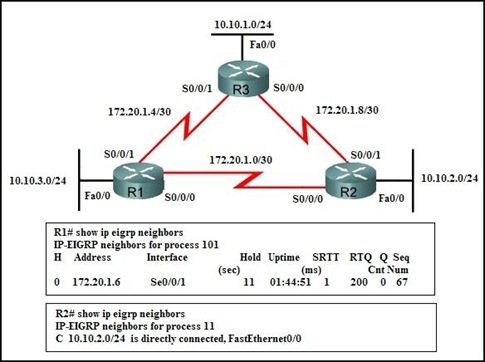 • The EIGRP process number on R2 is incorrect. • The Fa0/0 interface on R2 is shut down. 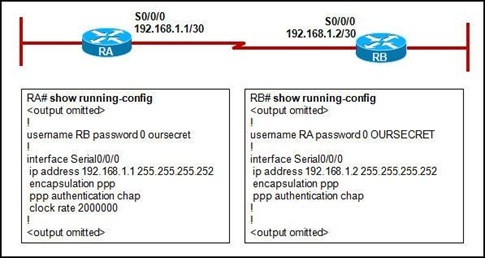 • The Fa0/0 interface on R2 has an incorrect IP address or subnet mask. Refer to the exhibit. 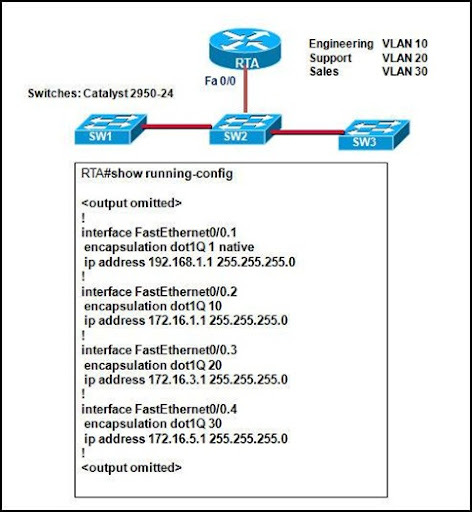 The network administrator correctly configures RTA to perform inter-VLAN routing. Using the show vlan command, the administrator verifies that port Fast Ethernet 0/4 is the first available port in the default VLAN on SW2. 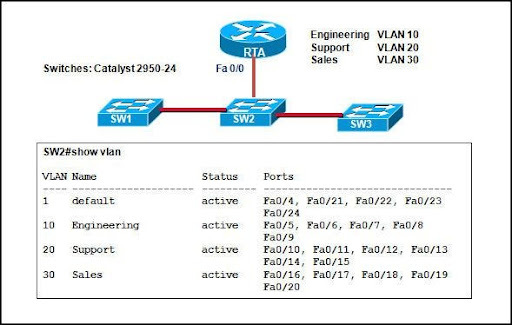 The administrator connects RTA to port 0/4 on SW2, but inter-VLAN routing does not work. What could be the possible cause of the problem with the SW2 configuration? • Port 0/4 is not active. • Port 0/4 must be a member of VLAN1. • Port 0/4 is configured in access mode. • Port 0/4 is configured as a trunk port. Refer to the exhibit. The network administrator is unable to ping from the console of router R3 to host 10.10.4.63. What is the problem? • Router R2 does not have RIP correctly configured. • Router R3 is missing a network statement for network 10.0.0.0. 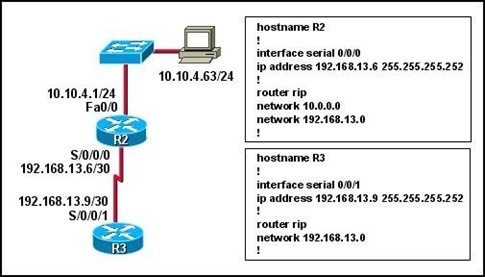 • There is an addressing problem on the link between routers R2 and R3. Refer to the exhibit. 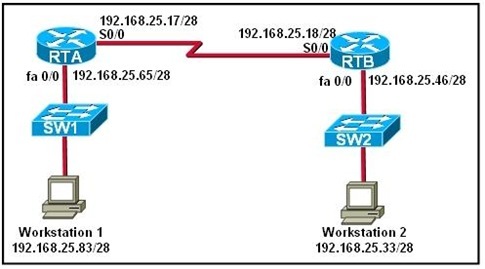 A network administrator has implemented subnetting using the network 192.168.25.0 and a /28 mask. Workstation 1 is not able to ping with Workstation 2. What is a possible cause for this lack of communication? • Workstation 1 and Workstation 2 are on the same subnet. • The serial connections are using addresses from the LAN subnets. • All hosts in the network must be in the same subnet to communicate. • Workstation 1 is not on the same network that the RTA router LAN interface is on. • It should be done monthly as a minimum standard. • It should be performed when all switch Cisco IOS versions are upgraded. • It should be done when all network printers are upgraded to a new model. • It should be done when the network is performing at normal activity levels. • It should be done whenever an SLA has been signed with a new service provider.